Mr. Henry E. Kinchin, Steward of Stratford Circuit since 1901, has covered himself with credit in a situation which called for a Chancellor not deficient in the best qualities of head and heart. A native of Reading, he is a product of the vigorous Primitive Methodism in that town. He early became a Class leader and Local preacher. Subsequently at Matlock Bank and Harrow Road (Marylebone), the value and versatility of his gifts were gladly recognised. His services to Stratford Circuit cannot be adequately appraised. The qualities of Evangelist, Organiser and leader have combined in an unsurpassed devotion. The Circuit could not recently have maintained its independency but for the courage and consummate energy of its Senior Steward. Ministers value his loyal friendship, laymen respond to his inspiring leadership. The esteem which he enjoys in the London First District was revealed in his election as delegate to the Tunstall Conference. 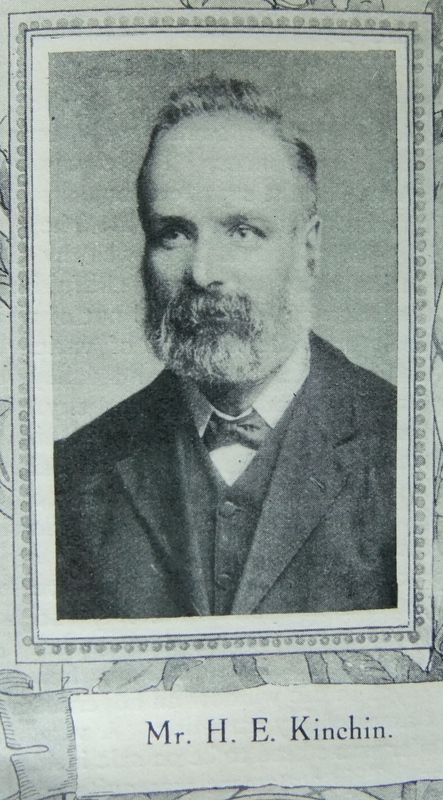 Henry was born in 1858 at Reading, Berkshire, to parents Edward and Charlotte. Edward was a shoemaker (1861) and later a house painter (1871). Census returns give the following occupations for Henry. Henry married Mary Curtis (abt1843-1923) in late 1880 at Reading, Berkshire. Census returns identify one child. Henry died in the summer of 1933 in the West Ham Registration District.